The Volkswagen Group of America is going green with its "Think Blue" approach of investing in renewable energy, including a recently completed 9.6 MW solar project at its production plant in Chattanooga,Tennessee. With recent energy initiatives, global car company Volkswagen is showing that the auto sector can be part of the reduction in greenhouse gases solution by becoming more energy efficient in its manufacturing processes and investing in renewable energy at its plants. The company has implemented its "Think Blue. Factory" philosophy in all its auto plants to achieve more efficient use of energy, materials, and water while producing less waste and emissions. The recent commissioning of the company's solar park at its new auto plant in Chattanooga, Tennessee, is an example of how that philosophy is being put into practice. The installation supplies 9.6 megawatts of solar power that will provide 12.5 percent of Volkswagen's energy needs at the Chattanooga plant while the plant is in production. This is equivalent to the amount of energy consumed by about 1,200 homes annually in that area. Gustashaw, energy and utility specialist, plant infrastructure with Volkswagen Group of America. "My advice is to find a technology that works in your site specific conditions and give it a shot. This is the right thing to do. The one thing that we all share is the environment, and I can't emphasize enough that we have to protect the environment." For its effort, Volkswagen's Chattanooga auto plant has earned LEED Platinum certification from the United States Green Building Council—the only auto plant in the world to earn this level of recognition. The Volkswagen Chattanooga Solar Park is the largest solar array in Tennessee, the largest attached to an auto plant in the U.S., and one of the largest solar power installations attached to an industrial plant in the world, says the company. To put the project's size in perspective and as an indication of how far development of the global solar power industry has come, Phoenix Solar AG CEO Andreas Haenel commented that the Chattanooga installation alone is as large as the entire world market for solar power in the 1980s. Phoenix Solar was the engineering and construction contractor on the project, which took about six months to construct. Located on 33 acres near the company's $1 billion auto plant (which was opened in 2011 and produces 152,000 Volkswagen Passats per year) the solar power installation is owned and operated by a Tennessee-based company called Silicon Ranch. The solar park is flanked by wetlands on one side and a nature park on the other. Volkswagen to supply the power generated by the solar installation directly to the auto plant. Matt Kisber, Silicon Ranch president and CEO, explained the company's business approach. "Silicon Ranch has gained prominence as a low cost producer of solar energy by focusing on creating efficiencies through every step of the deployment process, enabling the company to offer renewable solar power at competitive rates." He added that this strategy has enabled their customers to make progress on their sustainability initiatives without draining resources from their primary business activities. Silicon Ranch has developed all its solar projects for its own portfolio. The Volkswagen project is a major contributor to that portfolio as the company currently has 15 MWs in operation and 38 MWs under construction. More projects are on the horizon later this year. Guenther Scherelis, Volkswagen general manager of communications, says the automaker took the approach of having a third party finance, design, build, and operate the solar power installation because Volkswagen's area of expertise is in manufacturing vehicles, rather than in operating solar power facilities. It made more sense to have a knowledgeable and experienced solar power provider manage the installation while providing power under a power purchase agreement to Volkswagen. He adds that integrating solar power into the auto plant's energy consumption will make Volkswagen more cost competitive as the company expects that energy costs will escalate over time. The solar array consists of 33,600 polycrystalline solar modules supplied by JA Solar, which are installed on fixed-tilt Unirac mounts. "This has been a tremendous collaboration for Unirac," said Peter Lorenz, Unirac's CEO. 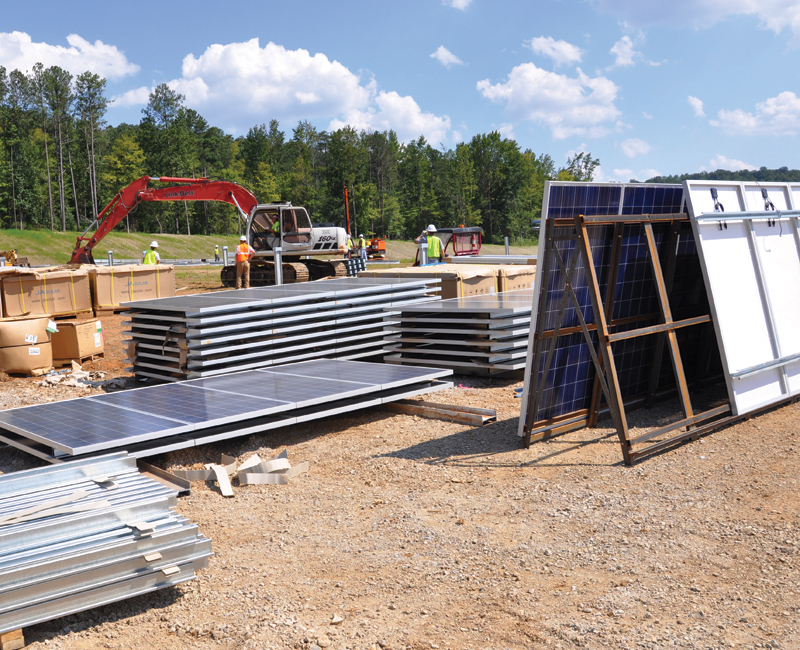 "The opportunity to work with Phoenix Solar and Silicon Ranch really demonstrates Unirac's ability to accommodate a broad range of foundation options in a major commercial project." 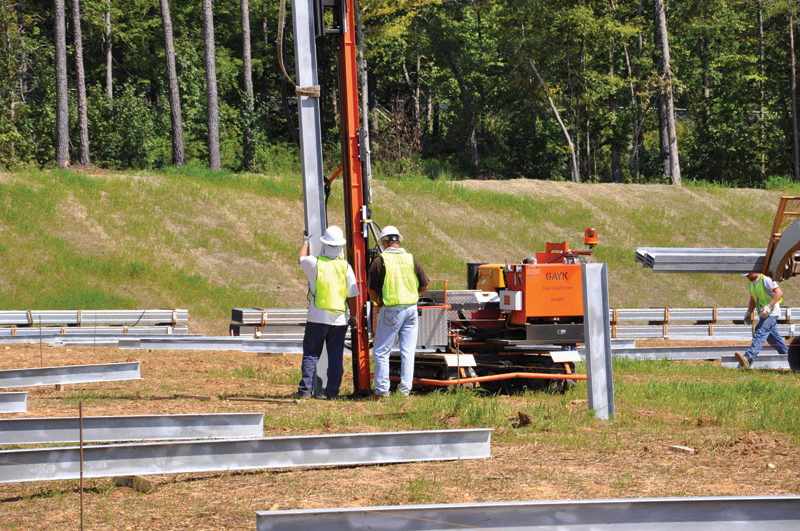 The Unirac ground mount solution, specifically engineered for the Volkswagen Solar Park project, combines its successful ISYS Ground Mount 2.0 with custom racking, resulting in an optimized total installed cost. The ISYS Ground 2.0 allowed for pre-assembly of module columns prior to installation of foundations and racking. Additionally, contractors were able to build the subassembly while assembling modules to rails in a controlled environment. This method produced a shorter project turn-around time and reduced field-labor, allowing greater cost savings. "Close collaboration with Phoenix Solar helped us engineer a superior product while reducing the total installation cost of this project," said Tony Borck, vice president, utility group, Unirac. The owner and operator of the solar project, Silicon Ranch, selected Phoenix Solar as its engineering, procurement, and construction (EPC) provider on the project. Ten SMA inverters convert the power from direct current (DC) to alternating current (AC) for use in the auto plant. When the plant is not in production, the power generated by the solar array provides the facility with 100 percent of its power needs. Silicon Ranch chose Phoenix Solar as its engineering, procurement, and construction (EPC) provider on the project because of a strategic relationship it has with the firm. "In developing this strategic relationship, we looked for an EPC firm who shared our business philosophies and would complement our company's strengths," says Kisber. "We found that in Phoenix Solar. Because of this unique relationship, we have access to Phoenix's global procurement power and depth of technical resources." He adds that Phoenix Solar has provided EPC services for all but one of Silicon Ranch's portfolio of projects. VW's David Gustashaw says there were no challenges to tie in the solar power production to the plant. He says that the power produced by the solar array is used on a priority basis and, depending on how much power it generates, the plant's conventional power provider simply fills in the gaps. There was no interruption in vehicle production when the solar power came on line, and it is being supplied throughout the 1.9 million square foot plant. "The technology was very easy to incorporate," says Gustashaw. "There was no drama and nothing special. It just integrated in beautifully and came on line quietly." 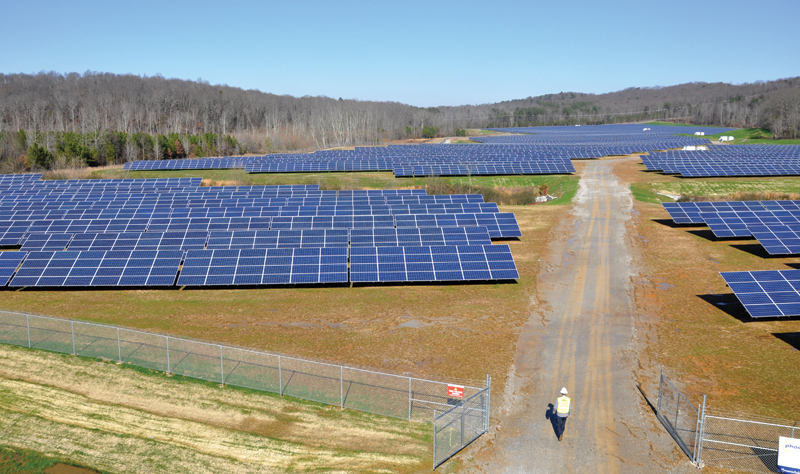 Kisber says the project was the first "behind the meter" solar installation in Tennessee Valley Authority's region, which is the generation partner to the Electric Power Board (EPB), the local distributor in Chattanooga. As such, it required a significant amount of coordination with TVA and EPB. "Everyone worked in a collaborative spirit to assist Volkswagen with accomplishing their LEED goals," he says. Volkswagen has set a goal of reducing its consumption of energy, water, and volatile organic compounds, as well as reducing generation of carbon dioxide and waste, by 25 percent per vehicle by 2018 for all its production sites. Installing solar power generation in Chattanooga is helping Volkswagen achieve part of that goal. "The onsite power generation by the solar array helps us offset the carbon dioxide throw from our prime electricity provider," Gustashaw says. Another example where Volkswagen has taken steps to reduce its energy consumption at the Chattanooga auto plant is in its paint shop. Scherelis says the painting function in an auto plant typically consumes about 50 percent of the plant's energy. "We have installed a new process that eliminates the primer coat and therefore also eliminates some robotic functions and the use of one dryer," he says. "By omitting one of these dryers, we omit about 20 percent of energy consumption from the paint shop." Gustashaw adds that taking steps like installing the solar array and other measures like operating more efficiently in the paint shop, is "part of Volkswagen's DNA." He adds, "When you look at Volkswagen throughout its history, we are about efficient products and transportation. It is now being applied to our manufacturing facilities. This is our ethic. Our products get excellent fuel mileage, and we want that same attribute in our manufacturing. If our products get excellent fuel economy, then so should our manufacturing. This facility in Chattanooga gets excellent fuel economy." Located on 33 acres near the company's $1 billion auto plant, the solar power installation is owned and operated by a Tennessee-based company, Silicon Ranch. The solar park is flanked by wetlands on one side and a nature park on the other. 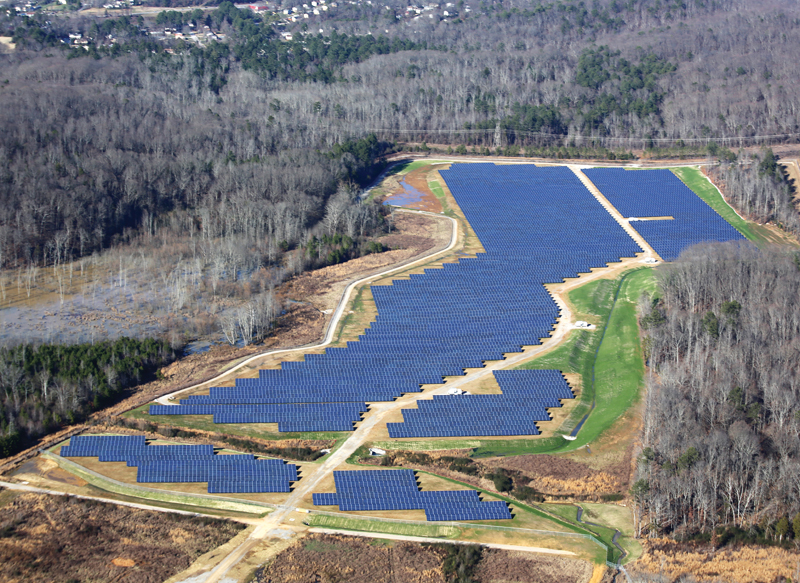 The Volkswagen Chattanooga Solar Park project has caught the attention of the company's competitors, some of whom have installed solar projects. During discussions at various industry functions in which paths are crossed, Gustashaw says the other companies are generally supportive of the direction that the automaker has taken with its commitment to solar power in Tennessee. He agrees that given the infrastructure typically used within the auto sector—such as large land dedications and large roof areas in auto assembly plants—there may be many potential opportunities for solar installations on many vehicle manufacturing sites. "But you have to be cautious—just because you have the roof area, that doesn't mean you have the load capability to accept whatever you put on it," Gustashaw says. "Solar panels aren't heavy, but you still have the requisite mounts and supporting infrastructure for an installation." The Chattanooga auto plant holds regular tours, which attract a wide variety of interested parties including individuals from other industries with an interest in how the solar power technology may be applied in their own facilities. "We have a diverse group of people who are very interested in the site, and it runs the gamut from people who are the believers to the people who are the doubters," says Gustashaw. Volkswagen has made a significant investment in various types of renewable energy at its plants worldwide, including another solar power installation at a plant near Barcelona, Spain, that is even larger than the Chattanooga location. In some cases it owns the installations and in others, it purchases the power from a third party.